Enjoy all your favourite delicacies this Thanksgiving with your loved ones! Ready your appetites and tummies, and let us create extraordinary Thanksgiving moments that you will truly treasure. Turn up at the award-winning Marriott Cafe to savour a scrumptious Thanksgiving Buffet Dinner overflowing with more than 90 masterfully-crafted International delicacies; mesmerise your loved ones with a luscious and succulent Thanksgiving dinner set under the twinkling stars and amidst a magical ambience at Pool Grill; host an impressive and heartwarming Thanksgiving celebration in the comforts of your own home with our hearty takeaway goodies. 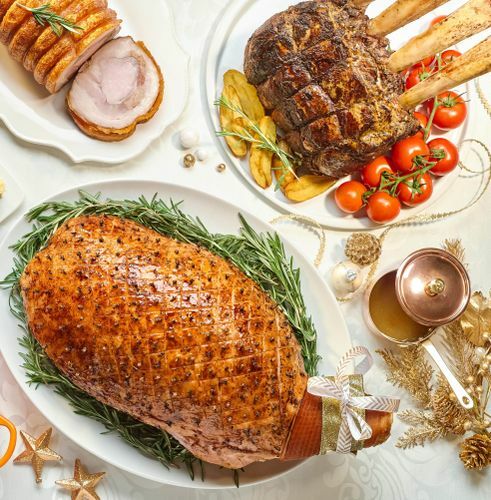 Fire up your taste buds and satiate your cravings with an alluring kaleidoscope of traditional festive delicacies from fresh Seafood on Ice and Sushi & Sashimi to Charcuterie & Cheese to succulent premium roasts; Asian delights as well as lip-smacking desserts. Highlights that will have you going for multiple helpings include Roast Turkey with Chestnut Bread Stuffing; Slow-roasted Australian Beef Prime Rib; Maple Glazed Leg Ham; Pan-fried Duck Foie Gras with Chutney, Relish & Brioche; Crispy Pork Saddle with Prunes & Pancetta Stuffing; Whole Salt-Baked Salmon; German Pork Knuckle with Sauerkraut, Bread Dumpling & Dark Beer Jus; Seafood Paella and more. Seafood lovers will be delighted with the seafood on ice and grilled renditions of these ocean gems. such as Freshly Shucked Oysters; Boston Lobsters; Crayfish; Snow Crab Legs; Prawns; Yellow Fin Tuna & Salmon Sashimi; Dijon Mustard Marinated Salmon; Beetroot Marinated Salmon; Lobster Thermidor; Oyster Florentine; Crayfish with Herb Butter; Grilled Mussels, and more. That’s not all. Marriott Cafe is offering the best of Western and Asian delicacies! Asian crowd pleasers to look forward to include Singapore Chilli Crab; Steamed Garoupa with Light Soya Sauce & Fermented Soya Beans, Braised Shiitake Mushroom with Abalone, Broccoli & Oyster, and more. The dessert counter marks the ultimate finale with dreamy luscious treats comprising of the classic Granny Smith Apple Streusel Pie; Honey Roasted Pecan Pie; the modern delight such as Vanilla Crème Catalan; Pumpkin Cheesecake; Zesty Citrus Pumpkin Cake; Maple Dark Chocolate Pot De Cream; Spiced Pumpkin Yoghurt Trifle, and more. With the busy days packed with hectic schedules, we often forget to take a moment to simply settle down and truly appreciate the moment that we have with our loved ones. Gather your family and friends to celebrate this joyous occasion and create precious moments with laughter and love over Pool Grill’s specially curated 3-course Thanksgiving dinner. Set under the scintillating night sky. Share flutes of effervescence and indulge into a taste of western cuisine at its best. Look forward to enticing delights such as Foie Gras Terrine; Honey Roasted Pumpkin Crème Soup; Stuffed Roast Turkey Breast & Leg Roulade; Pan Fried Cod Fish; Maple Dark Chocolate Pot De Crème; Warm Orange Pumpkin Strudel, and more. For dining reservations, please call 6831 4605 or email mhrs.sindt.fb.reservations@marriotthotels.com. All prices stated above are subject to 10% service charge and 7% Goods & Services Tax (GST) unless otherwise stated.